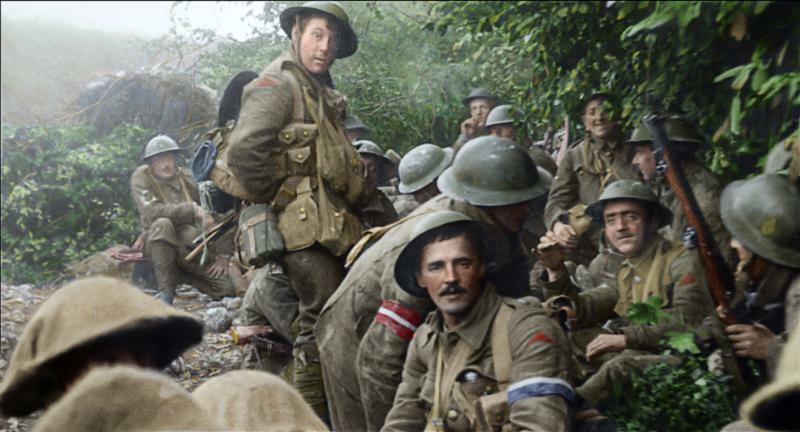 NEW YORK (CNS) — Director Peter Jackson, best known for helming “The Lord of the Rings” and “The Hobbit” trilogies, ventures far from Middle Earth in his innovative documentary on the First World War, “They Shall Not Grow Old” (Warner Bros.). Marking the centennial of the end of so-called “War to End All Wars,” Jackson’s project combines a lifelong personal interest in the global conflict with his trademark technological wizardry. The astonishing result brings to life a once silent and colorless world, establishing an immediacy and intimacy to the 1914-18 war that claimed 20 million lives. Over the course of four years, Jackson and a team of experts examined thousands of hours of archival black-and-white footage shot by British cameramen and preserved in the Imperial War Museum in London. In addition to restoration, Jackson chose to colorize many of the films, add sound effects and utilize the oral histories of veterans as narration. Emerging from the grainy, foggy images familiar from old newsreels are soldiers with ruddy-cheeked faces expressing a range of emotions, from patriotic pride to shell-shocked horror. The restored archival footage captures, in graphic detail, the slaughter inflicted by machine guns, cannons, grenades and poison gas. But it also records the mundane and the humorous, the camaraderie of the soldiers living in rat-infested trenches who rely on each other for morale and survival. Jackson employed lip-readers to reveal what soldiers were saying as they mugged for the cameras. The youth of the troops is a revelation. The enlistment age was 19, but as veterans recount, most lied about their age, with soldiers as young as 15 joining the ranks. “When they came to us, they were frightened children, and had to be made into soldiers,” one veteran recalls. “I gave every part of my youth to do a job,” admits another. “They Shall Not Grow Old” is not for the faint of heart, given the explicit sights of battlefield carnage. Nonetheless, older teens will benefit from an unorthodox and engrossing history lesson and a powerful reminder of man’s inhumanity to man. The film contains graphic archival footage of war violence, corpses and gore. The Catholic News Service classification is A-III — adults. The Motion Picture Association of America rating is R — restricted. Under 17 requires accompanying parent or adult guardian.